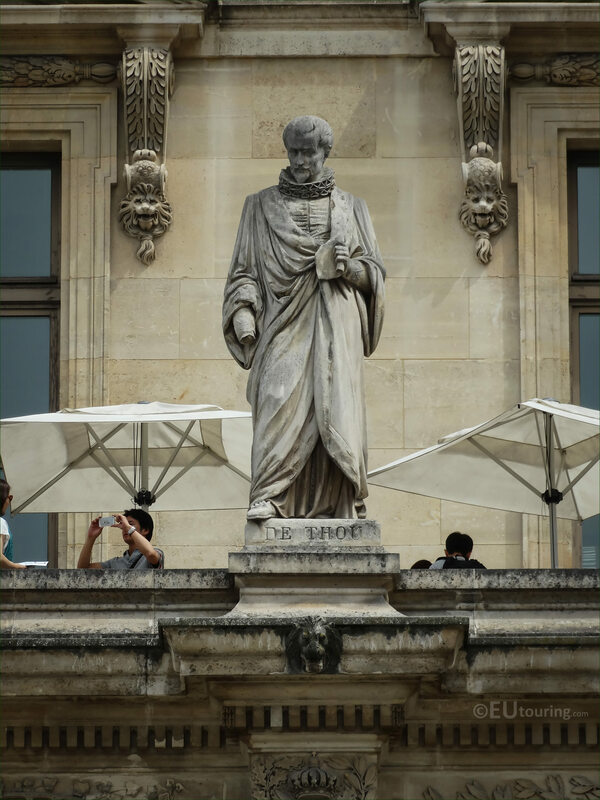 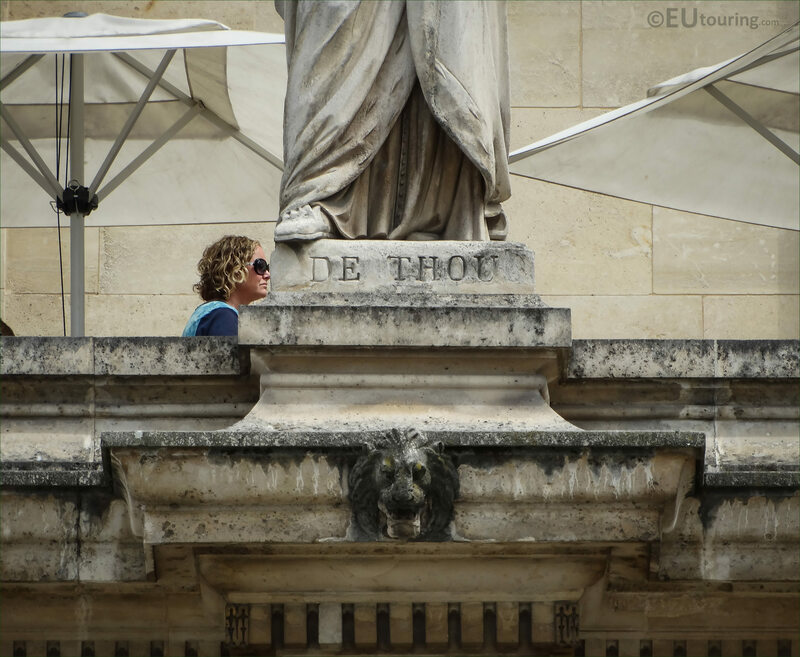 It was while we were walking around the Cour Napleon court of the Musee du Louvre admiring the facades, we took these high definition photos showing a statue of Francois Auguste de Thou, which is on the Aile Colbert wing in the 1st Arrondissement of Paris. This first image shows the location of the statue dedicated to de Thou positioned on the first level balustrade of the Aile Colbert wing, and this is one of the famous men in French history that are depicted on the facades around the courtyard of the Cour Napoleon of the Palais du Louvre. 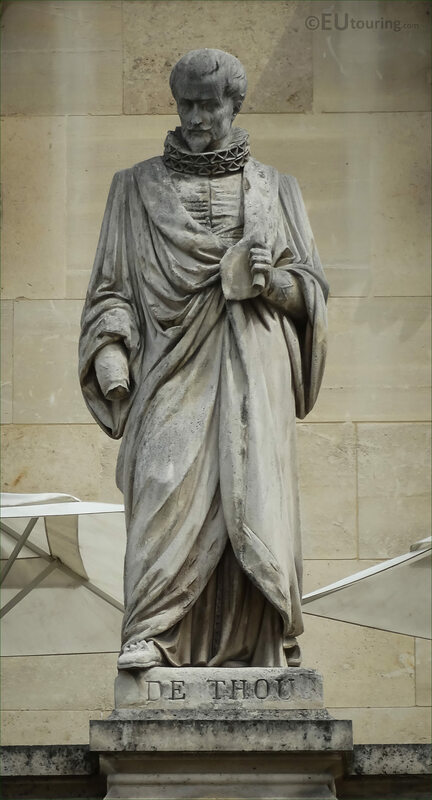 Now this statue was produced in stone by the artist Auguste Louis Deligand, sometimes written as Louis Auguste Deligand, who was born in 1815 and becoming a French sculptor he passed away in 1874, yet you can also see a plaster model of this particular statue at the Musee d'Orsay, which was sculpted between 1855 and 1857. And in this last close up HD photo you can see the plaque with its name inscription on the base of the statue dedicated to Francois Auguste de Thou, who was born around 1607 and became a councillor for the parliament of Paris and he was a collector of manuscripts, which included a Greek miniscule manuscript on paper of the New Testament. 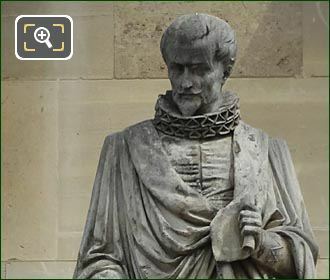 Yet his silence during the conspiracy of Spain and the Marquis Cinq-Mars, meant he was classed as guilty, and was beheaded upon the orders of Cardinal Richelieu on 12th September 1642.